Later this year, 1st Marine Regiment will host a bilateral exercise in the Stockholm archipelago, named “Archipelago Endeavor 18”. 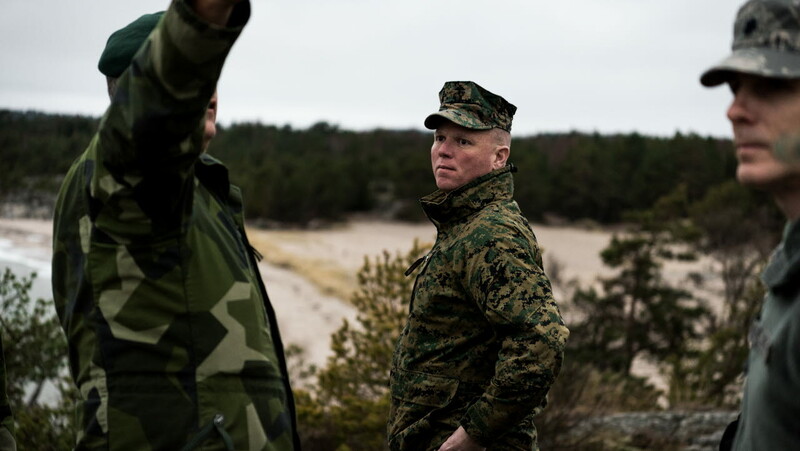 The purpose of the exercise is interoperability and cooperation between the Swedish marines and the United States Marine Corps. To get a glimpse of the exercise area and to meet with his Swedish counterpart, Colonel Patrick Keane visited Haninge garrison just outside of Stockholm. It is a gray and grim winter afternoon in early January, but the typical seasonal snow is visibly absent. At Haninge garrison just outside Stockholm lays a Combat Boat 90 moored at a pier, waiting to go to sea. Today, its mission is to carry a delegation of American visitors to the island Utö in the Stockholm archipelago. Head of the U.S. delegation is Colonel Patrick Keane, Assistant Chief of Staff G5 at the U.S. Marine Forces in Europe and Africa (US MARFOREUR/AF). As the Combat Boat heads out to sea, Colonel Keane is offered the possibility to drive the boat. An opportunity very few would like to miss out on. “The Combat boat is a very capable platform, ideally suited for the missions of the 1st Marine regiment. Commanding the boat kind of feels like if you were ‘The Red Baron’ of the sea”, Colonel Keane said. The 1st Marine Regiment is a unique unit in the Swedish Armed Forces. Founded in 1902 and reorganized in 2000, the Marine regiment has its roots in the Coastal Artillery, and a part of the Swedish Naval forces. It is a unit operating where water meets land everywhere from coastline to river deltas, utilizing combat boats, hovercrafts, small boats and kayaks for its transportation. The unit uses multiple weapons such as controllable mines and missiles as well as mortars, designed to combat qualified adversaries on land, above and below the water surface. Additionally, and despite its geographical specialization, the Marine regiment has been a successful expeditionary force in Chad and Kosovo as well as Afghanistan and the Gulf of Aden. Over the years, the Marine Regiment has established several bilateral and multilateral collaborations. In that way, the Swedish marines has obtained new skills such as the ability to deploy combat boats on other states’ amphibious ships, carry out combined amphibious landings and to coordinate close air support (CAS). One of the key partners is of course the U.S. Marine Corps. Later this year, parts of the Marine Corps are invited to an exercise in Sweden. “We have a tremendous partner in the Swedish Armed Forces!”, Colonel Keane states while standing in the combat boat’s troop compartment. “There is a great amount that we can learn from each other. Just one example is your experience with conducting maneuvers from the sea, but also in the cold weather experience that the Swedish Armed Forces has. The Marine Corps is placing much more emphasis on to improve its cold weather skill in the future”, he said. The Combat Boat cruises between the islets and skerries. A few minutes later, the delegation disembark on the island Utö, a couple of miles outside the garrison. On the island lie one of the Marine regiments’ firing ranges. Based in the 1940s, the firing range has been adapted to fit the need of amphibious forces with landing possibilities as well as fields for tank practice and close air support. “The range complex at Utö has got tremendous potential with respect to doing combined arms exercises and conducting maneuvers from the sea. It is an ideal place where we could do interoperability and partnership training with the Swedish marines and hopefully other European forces in the future. The Marine Corps stationed in Europe are very focused on the Nordics, and the possibilities of extending the cooperation. In that way, we can make our cooperation more effective and ever more mutually beneficial”, Colonel Keane concludes.